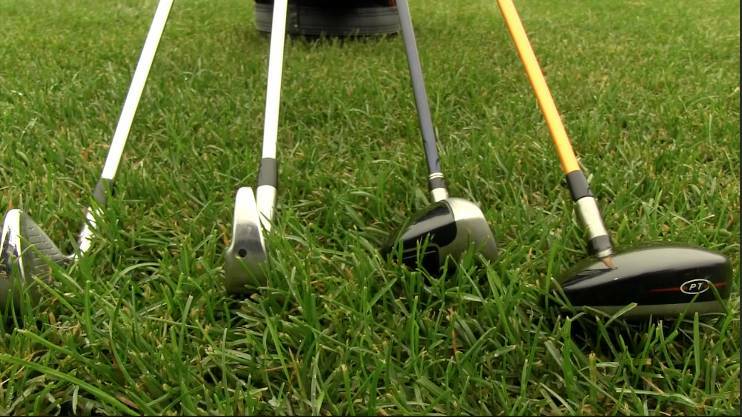 Most average golfers don’t put a lot of effort into choosing what clubs to put in their bag. Understanding the tendencies in your own game can save you from creating holes in your own bag from club to club, and in this segment of course management, Troy Klongerbo explains why you should know how to fill those gaps and get the most out of your set of clubs. Hey golfers, Troy Klongerbo here with USGolfTV, and today we’re going to talk about filling gaps in your golf bag. Now in the average bag, you’re allowed 14 clubs to use during your round. Now golf companies standardize your irons to where they kind of have each iron going through the bag, and a lot of times we pick up a wedge, a lob wedge and a sand wedge here and there, and we obviously have our driver and putter. But a very overlooked part of the bag is filling in that gap between your longest iron and your shortest wood. Most times, that’s a 3 wood to about a 4 iron. Now we have some different options to fill that. First of all, we could just fill it with a longer iron, maybe filling it with a 3 iron or 2 iron if you feel comfortable with that. You could fill it with a hybrid, which in the last ten to 15 years has really picked up its popularity and become a club that even guys on the Tour are using; or fill it with a different wood. Maybe if you have a 3 wood as your longest club, maybe we would bump it down to a 5 wood or a 7 wood. So we’re going to spend a few seconds talking about the positives of using each of these. Now if you’re a better player—if you tend to have no problems with getting the ball up in the air on your own—maybe a long iron is the good choice for you. You can still get that penetrating ball flight, but you’re not too worried about catching balls that go way over the green or past some of your landing spots. The nice thing about having a hybrid in your bag is that it’s a very versatile club; it’s designed with a lower center of gravity than an iron, but it’s also got a shallower sole than a wood does. So it gives you the option to hit it out of the rough, out of the fairway, and from a lot of different spots you might find yourself in on the golf course. Hybrids offer great versatility to help fill the gaps between woods and irons. Now if you were to go with a 5 wood or a 7 wood, that club’s going to go the furthest out of any of these clubs. It’s going to go the furthest and the highest; so if you’re a higher handicap, that might be a great option for you. But I encourage you guys to head to the range, talk to your professional, get into a club that’s either a hybrid, a long iron, or a shorter wood that’s going to help you fill that gap the best and help you manage your game the best on the golf course.